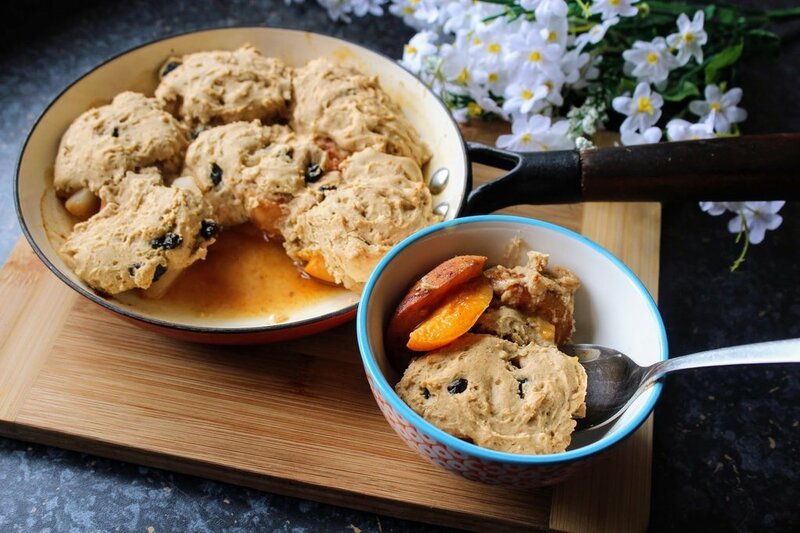 This simple cobbler is delicious, nutritious and can be enjoyed hot or cold. 1) Place the fruit, maple syrup, lemon juice and cinnamon in a skillet pan and cook on a medium heat for 10 minutes to allow to soften slightly. 2) Preheat the oven to 180 degrees C.
3) Combine the flour, sugar, baking powder and cinnamon in a bowl. Use you hands to work the butter/margarine into the dry ingredients to form a coarse mixture. 4) Whisk the milk and vanilla and pour into the bowl, using a fork to work it all in – you should have a thick batter. Stir in the dried cherries. 5) Dollop large spoonfuls on top of the fruit, placing next to each other to just about cover. Bake for 20 minutes until golden and the cobbler has risen and firmed up. Enjoy hot or cold!